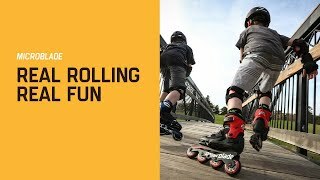 Rollerblade invented and makes the best adjustable inline skates for kids. The skates are adjustable 4 full sizes to grow with children's feet and can also be shared with a younger sibling if necessary. The easy to use adjustment system works with the push of a button and has markers in the toe area so aligning the skates is easy and reliable. The Microblade 3WD structure provides better support, has engineered mesh for fit and breathability and comes with a 3x80mm wheel set up for a 3WD upgrade out of the box. The Junior Fit liners make the Microblade very comfortable and the wheel/bearing combination are perfect for kids to get started with the right amount of speed. The closure system ensures a secure fit with easy on and off abilities. Having a positive first experience on skates will increase the chances kids will continue to skate, create a life long activity, stay active and improve their fitness abilities while having fun. Brake is on the skate. 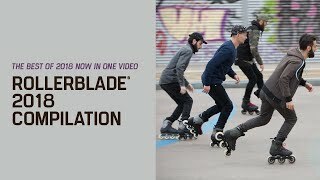 - BEST KIDS INLINE SKATE FOR ANY LEVEL Microblade 3WD is ideal for kids looking for a better quality product to upgrade to or wanting to experience 3WD. - VERSATILE AND DURABLE INTEGRATED FRAME is combined with the shell to get kids closer to the ground for a lower center of gravity and provide a lot of durability for young skaters. It also features a 3WD set up with 3x80mm wheels. Skates can also have a 4x72mm wheel set up if desired but requires an additional wheel/bearing purchase. - ROLLERBLADE PERFORMANCE WHEELS 80mm/82A wheels are paired with SG3 bearings for a lasting, smooth roll with just the right amount of speed to keep the roll a little safer, but still exciting.